Where is this study placed within the wave modelling community? This paper has an important application to non-linear breaking waves in shallow water. The approach taken in this category follows the fully non-linear equations for a deterministic time-resolving model for one realisation of wave frequency, similar to the approach of Ravel et al (2009). However, unlike Ravel, the numerical method used reformulates the convective mass fluxes in order to allow highly non-linear behaviour at the interface. This allows breaking waves to be considered, which was not considered by Ravel et al (2009). It is known in the wave modelling community that as the water depth reduces, wave breaking becomes an important phenomenon. However, there is also the simultaneous effect of bottom friction, and it is difficult to separate the effect of bottom friction from the effect of wave breaking in shallow water. 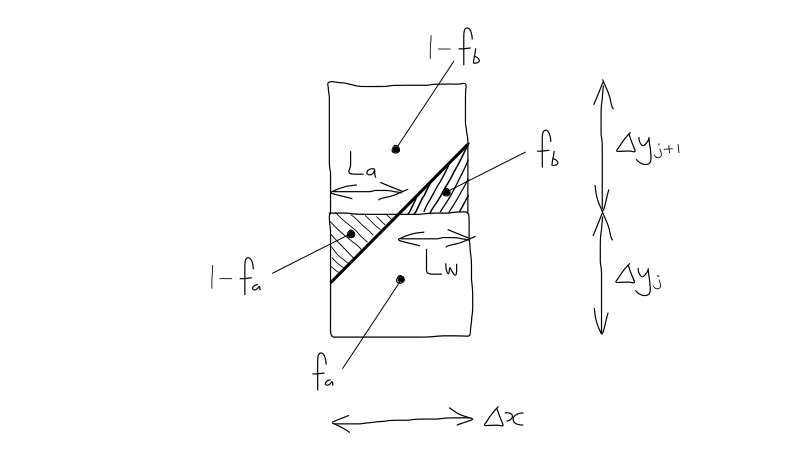 Although this study focusses mainly on wave breaking, it follows the approach outlined by Cavaleri et al (2007) in which wave breaking and bottom friction could be studied together if needed. The time resolving approach may be better suited to non-linear breaking in shallow water compared with stochastic methods because of the highly non-linear and dissipative effects that are present. However, there is an inherent computational penalty of the time-resolving approach as multiple realisations may be needed. This study is also in the class of numerics, attempting to minimise the numerical errors created due to the description of the flow field. The approach has the potential to introduce less numerical error compared to the arithmetic mean approach for the density term in the convective mass fluxes of say Zwart, Burns and Galpin (2007). The approach is 2D, such that the wet-dry areas are really wet-dry lengths, but most numerical simulations of this type are 2D. The mean density approach can be shown to produce 450 times the convective mass flux compared with the wet-dry areas method. 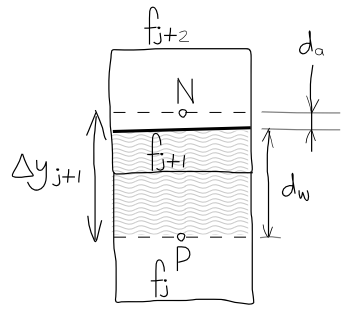 The mean viscosity approach produces 10 times the diffusive mass flux, due to the smaller change in viscosity compared to density across the interface (so this was not considered). What value do the terms \(L_a\) and \(L_w\) have? 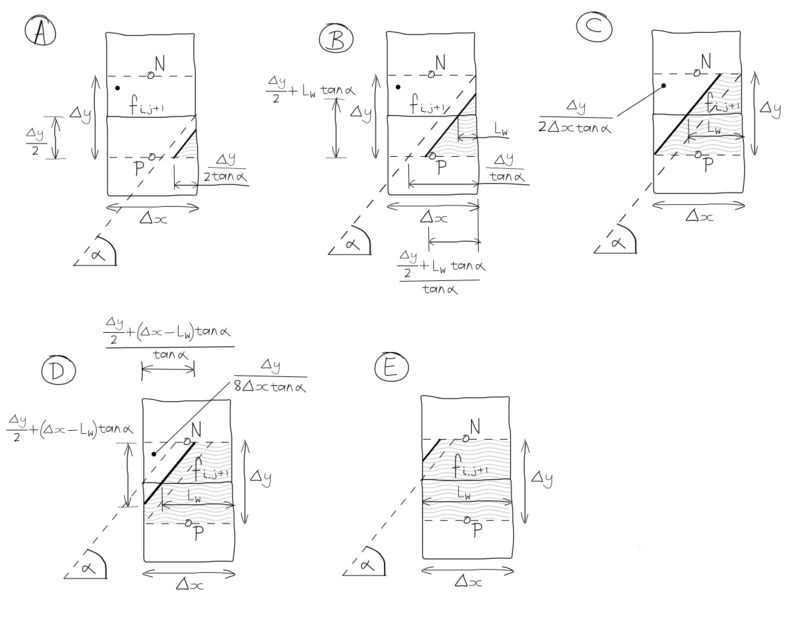 Now we only need to calculate the wet dry areas case 1, and then rotate it’s orientation for the other cases. What do we need to compute? 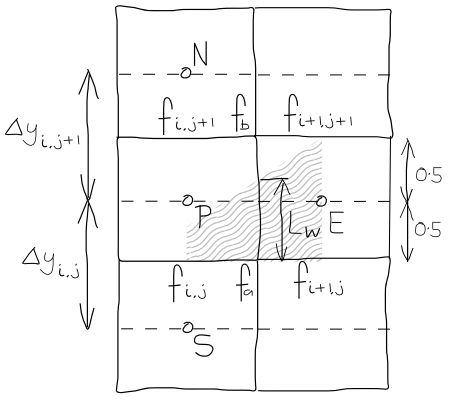 We are concerned with the viscosity at the interface between points P and N.
As Patankar (1980) suggests, we must determine the distance to the interface from the points P and N.
The use of the harmonic mean follows the suggestion of Patankar (1980) who used it for non-uniform conductivity in the diffusive term. Patankar (1980) dismisses the use of the arithmetic mean as too simplistic, but he did not consider the geometric mean or the infinite norm mean see Schmeling et al (2008). We also don’t know whether turbulent viscosity can be best represented by these averaging methods. 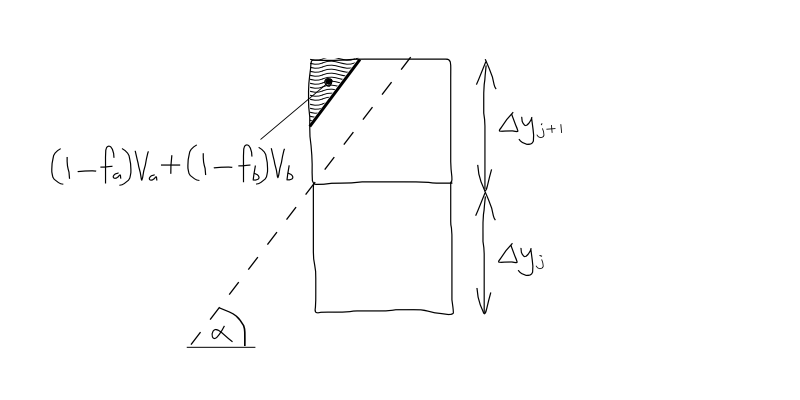 The angle \(\alpha\) is from Brackbill et al (1994) - I’m not sure why the angle the interface makes with the x-axis would be different for the v control volume? 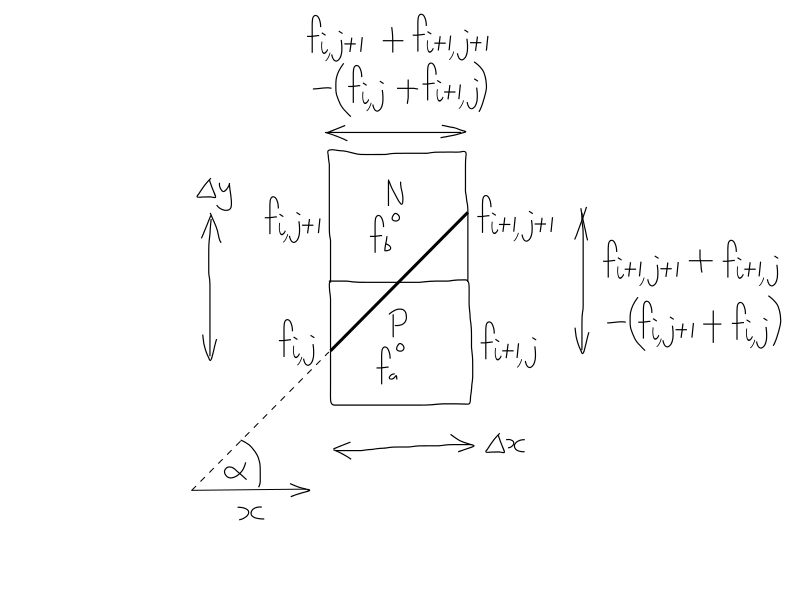 Or why we would need another equation for the same value? Is this because the v-volume fraction is stored at the faces and not the cell centres? Why isn’t this the same as Equation (18)? 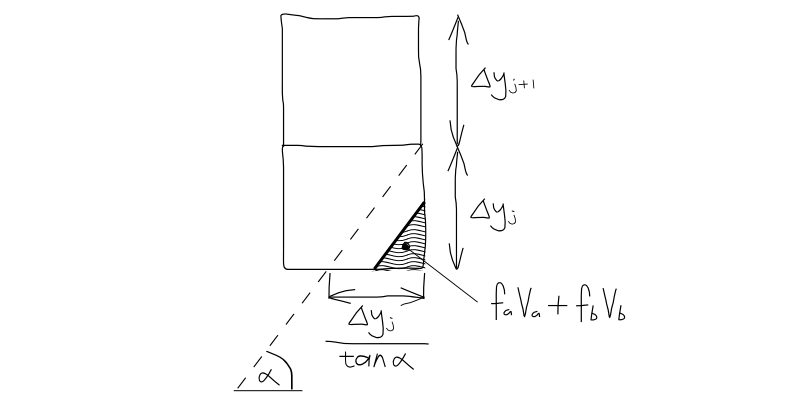 BIG QUESTION: Why is the wet length based on the u-volume fraction cell-centred and the wet length based on the v-volume fraction face-centred? The u momentum equation (16) and v momentum equation (17) are solved iteratively until the normalised residuals are small (perhaps using the tri-diagonal matrix algorithm). At this point we have satisfied momentum conservation. At this point we have satisfied the equations for volume, mass, u momentum and v momentum conservation. Normal to the interface, the volume fraction is between 0 and 1 on only one node. 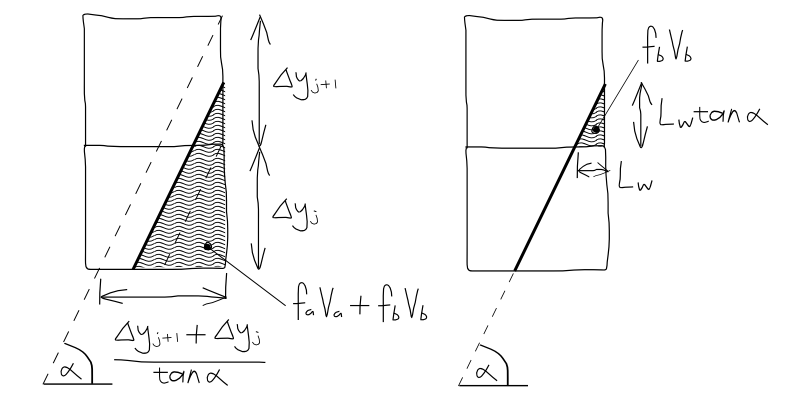 The solution of volume fraction is calculated from the solutions of \(u^n\), \(v^n\) and \(f^n\) by CICSAM. 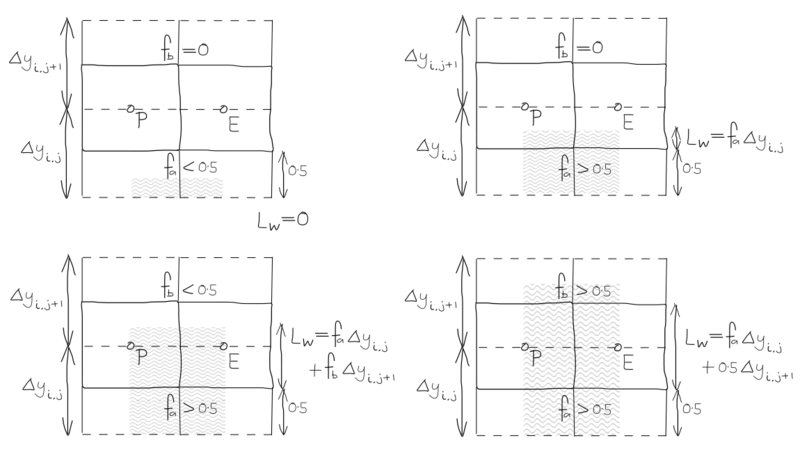 The solutions of \(u\), \(v\) and \(p\) are obtained from the SIMPLEC-PISO algorithm after \(f\) has already been obtained. 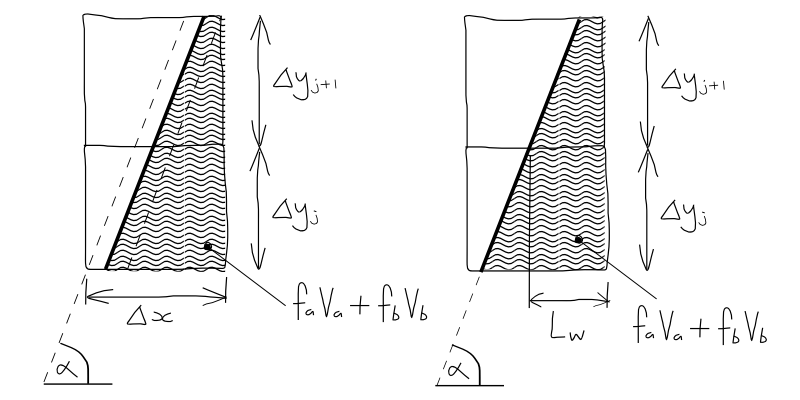 A wave is modelled using the inviscid non-linear solution to the wave equation as the inlet and initial conditions (the harmonic solution to the velocity potential described by Laplace’s equation plus boundary conditions). 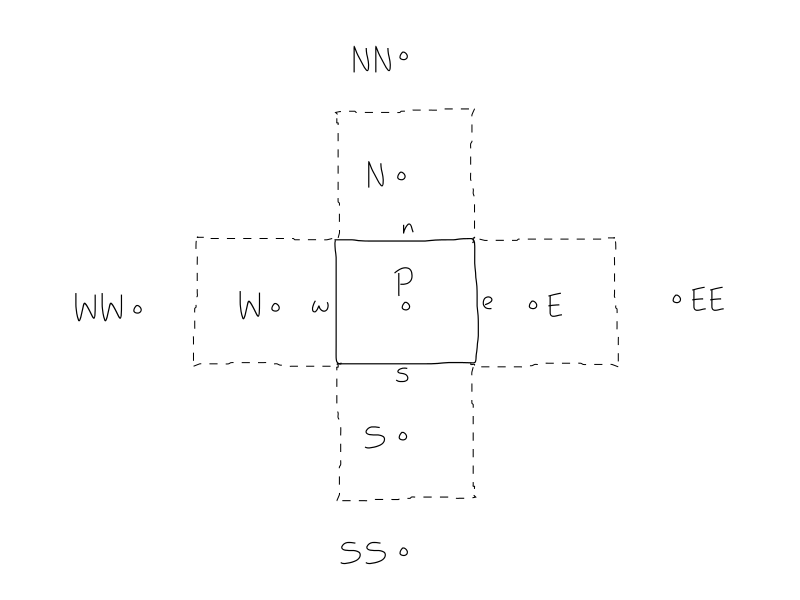 The model has a wall at the bottom boundary, a symmetry condition at the top, an inlet velocity, plus an opening at the outlet. 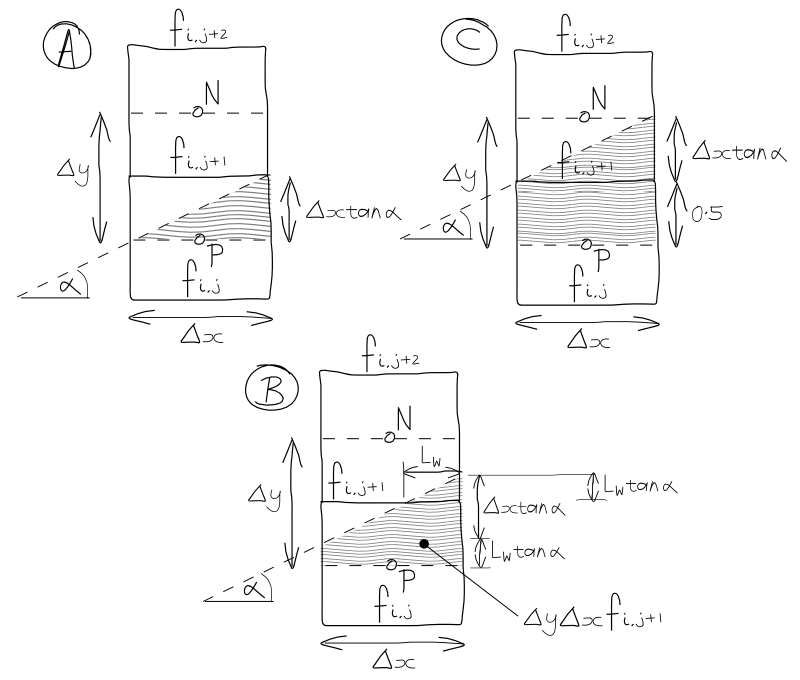 I wonder whether a comparison between the standard arithmetic approach to the mass fluxes and the wet-dry areas method would also be useful to compare the shear stress computed at the interface. The validation with experimental data was also conducted against images for the a collapse of a water column. It was found that the qualitative flow features, such as the hump in the water column, the strong jetting and the air pocket near the wall were all present in both the simulation and the experimental images. However, as the paper admits, there is no quantitative measurement to make this validation more complete. The breaking point is defined as the point where the speed of the water particles becomes larger than the phase speed of the wave. At this point the front of the water wave becomes vertical. To test whether the physics of this phenomenon is reproduced, a numerical simulation was run with the wet-dry areas method using the same parameters as the PIV experiment of Change and Liu (1998), which is where wave breaking was measured. It was found that the dimensionless water particle velocity was in the range 1.0c to 1.1c (where c is the phase speed), which matches the measured value of 1.07c. 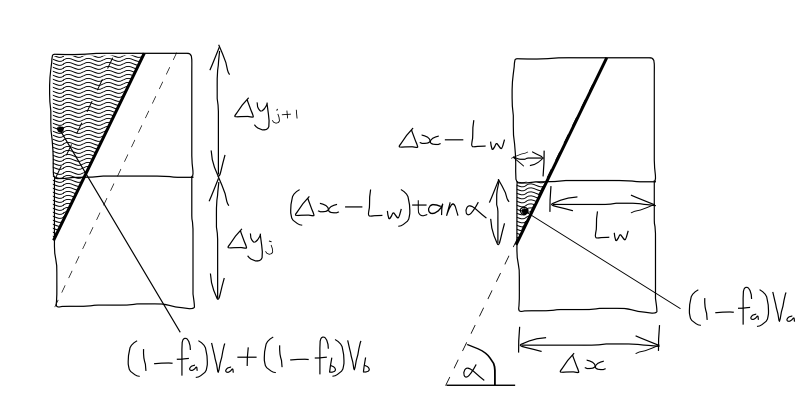 This was performed for the water column collapse application for T=3.99. Uniform, structured grids were used in this case. 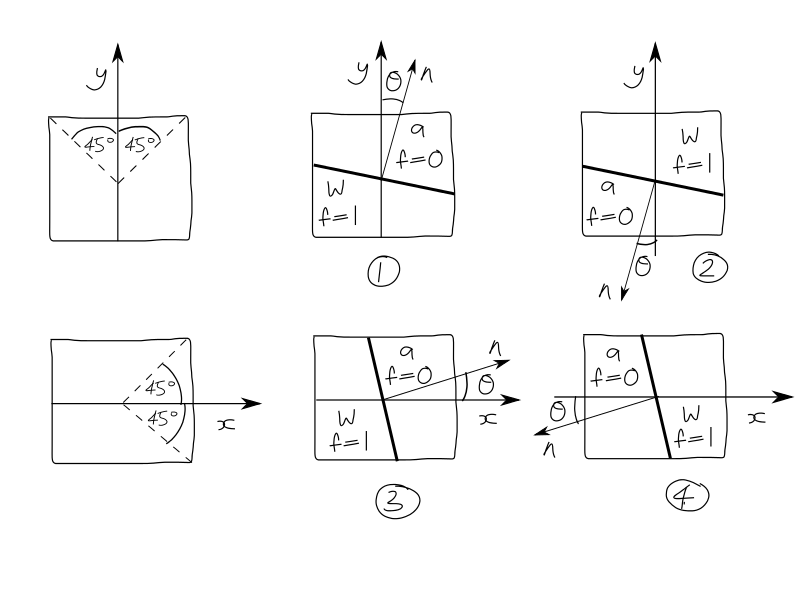 I wonder whether non-uniform structured grids or non-uniform unstructured grids might be more numerically efficient, although they may not be less diffuse. The first 20 timesteps of the water column collapse application was also used test robustness. The SIMPLEC algorithm used is unconditionally stable, however the convergence at each timestep depends on the timestep - i.e. divergence may occur if the timestep is too large. The minimum number of iterations per timestep was set to 15, which was achieved quickly after the first five timesteps. Less efficient than the average density approach.